Naki’o’s lucky day came when Christie Tomlinson, a vet tech in Colorado, adopted him. 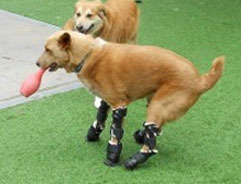 As he grew, it became harder for him to get around, so Christie raised money to have two prosthetic legs made for his back legs. Naki’o did so well with the two legs built by Martin Kaufmann, founder of Orthopets, that Martin decided to build front legs for him too. For free! 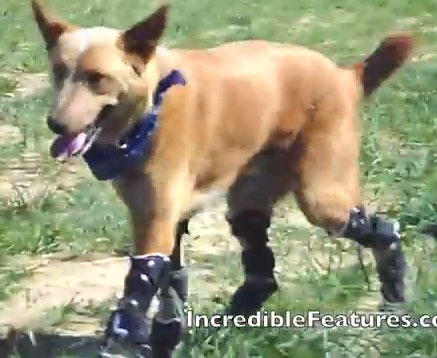 Naki’o is the first dog to have four prosthetic legs and it looks like he’s doing great. I thought Martin’s name looked familiar and it should. I’ve written about him before when he made a set of wheels and a mono-ski for Kandu, a pup without front legs. Check out Naki’o on his new legs!